I will be teaching an eight week course about the history of Imperial Spain at the University of Toronto, School of Continuing Studies on Tuesdays from March 6 until April 24 at 11am. Click here for more details and to register. 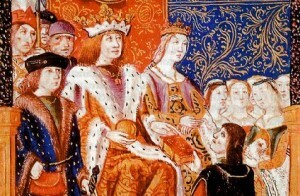 Ferdinand and Isabella transformed Spain into a world power. They sponsored Columbus’s voyages to the Americas and formed alliances with other European kingdoms. This new imperial Spain had a dark side in the rise of the Inquisition, the expulsion of Spain’s Jews and the exploitation of the colonies’ native peoples. Gold and silver from the Americas made Spain’s rulers the richest in Europe until the Golden Age came to an end with the wars of the 18th century. Join Carolyn Harris for illustrated lectures and lively discussion about the rise, fall and enduring influence of imperial Spain. Discern the lessons of the rise and fall of Imperial Spain for modern politics and international relations. Appreciate the art and culture of Golden Age Spain and their lasting impact on painting, literature and architecture. Trace the influence of Imperial Spain on the politics and culture of Latin America today. Ferdinand and Isabella transformed a united Spain into a world power, sponsoring Columbus’ voyages to the Americas and forming alliances with other European kingdoms. This new Imperial Spain had a dark side: the rise of the Inquisition, the expulsion of Spain’s Jewish population and the exploitation of the native peoples in the colonies. Gold and silver from the Americas made Spain’s rulers the richest in Europe until its Golden Age came to an end with the wars of the 18th century. Learn about the rise and fall of Imperial Spain and its lessons for politics and international relations today. King Felipe VI of Spain’s sister, Infanta Cristina will face charges of tax fraud on Monday. I was interviewed about the likely repercussions of the trial for Spain’s royal family by Alistair Dawber at the The Independent. The charges against Cristina are contributing to a generational divide regarding support for the monarchy in Spain. As I discussed in a previous column, those who remember Francisco Franco’s dictatorship admire former King King Juan Carlos for managing a peaceful transition to a constitutional monarchy. In contrast, there are many younger people who view the monarchy as out of touch with current economic conditions in Spain. 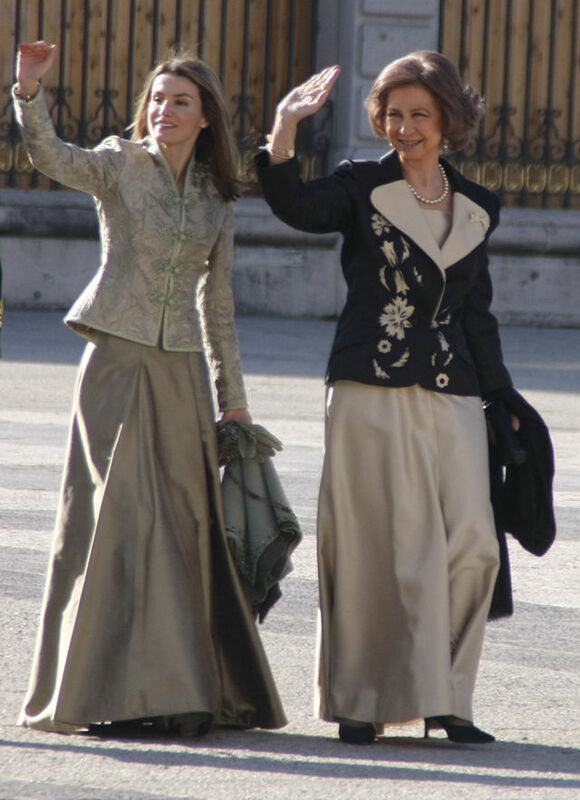 While King Felipe, Queen Letizia and their children are personally popular, the charges against Cristina and Juan Carlos’s 2012 elephant hunt damaged the reputation of the royal family. I do not believe Cristina will resume a more prominent role in the royal family, even if she is acquitted of the charges. There is a general trend in Europe toward more streamlined royal families that emphasize the public role of the monarch and his or her consort and children instead of the larger royal families of the past where a wider circle of relatives would represent the monarch and perform public engagements. The year 2015 marks the 800th anniversary of the Magna Carta, the landmark charter that placed limits on the power of the English king. Neither the king nor his rebel baron opponents necessarily expected its terms to be respected for long. But some of the Magna Carta’s principles – like the right to trial by peers and due process – have become basic to common law. The charter influenced the creation of Parliament and the concept of equality before the law. Later interpretations informed the American and French Revolutions, Canada’s Confederation and the UN Universal Declaration of Human Rights. The 800th anniversary is being celebrated around the world (a surviving copy of the Magna Carta will be exhibited across Canada). Join Carolyn Harris, author of Magna Carta and Its Gifts to Canada: Democracy, Law, and Human Rights , and discover the enduring impact of this document on the modern world. Click here to register! For centuries, artists sought out royal patrons to advance their careers. European monarchs were eager to fill their courts with artists to demonstrate their own acumen and prestige. Through lectures, images and discussions, Carolyn Harris will lead you through a lively exploration of the relations between great artists and their royal patrons. These include Hans Holbein and Henry VIII, Leonardo da Vinci and François I, Anthony van Dyck and Charles I, Peter Paul Rubens and Marie de Medici, and Élisabeth Vigée-LeBrun and Marie Antoinette. We will look at Catherine the Great, who helped found the Hermitage Museum, and Queen Elizabeth II, who is appreciated as a “curator monarch” for her part in opening the British Royal Collection to the public. You’ll learn more about the collaboration and tension between royalty and artists that produced some of Europe’s most famous works of art and established collections now featured in great museums around the world. Click here to Register! Ferdinand and Isabella transformed a united Spain into a world power, sponsoring Columbus’ voyages to the Americas and forming alliances with other European kingdoms. This new Imperial Spain had a dark side: the rise of the Inquisition, the expulsion of Spain’s Jewish population and the exploitation of the native peoples in the colonies. Gold and silver from the Americas made Spain’s rulers the richest in Europe until its Golden Age came to an end with the wars of the 18th century. Join Carolyn Harris and learn about the rise and fall of Imperial Spain and its lessons for politics and international relations today. Click here to Register! King Juan Carlos of Spain abdicated yesterday and his son was proclaimed King Felipe VI today. I discussed the popularity of Juan Carlos’s consort, Queen Sofia, and the history of royal marriage with Atlantico this week. 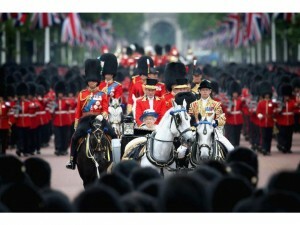 The History: In the British Isles, the monarch’s birthday has been a time for public celebrations for centuries. Elizabeth I (r. 1558-1603) employed a “Fire Master of England” to release fireworks on special royal occasions. The earliest versions of the Trooping the Colour parade date from the reign of King Charles II (r. 1660-1685). Following the Restoration of the monarchy in 1660, regiments displayed their flags in a parade, enabling all soldiers to recognize their regimental colours for use as a rallying point in battle. During the reign of King George II (r. 1727-1760), Britain decided to combine the celebration of the sovereign’s official birthday with the Trooping the Colour Parade. In 1901, King Edward VII, whose actual birthday was November 9, decreed that the Trooping the Colour should always take place in June and was the first monarch to review the troops in person at this event. The Queen has attended Trooping the Colour every year of her reign except for 1955, when a railway strike prompted the cancellation of the event. 2) Prince William, the Duke of Cambridge celebrated his first Father’s Day on the polo field. The Duchess of Cambridge and Prince George were there to watch the game. The History: Prince George of Cambridge, who will be one year old next month, made his first public appearance since his April tour of New Zealand and Australia with his parents, the Duke and Duchess of Cambridge, when he attended a charity polo match on Father’s Day. George wore red and white striped overalls to the Jerudong Polo Trophy at Cirencester Park Polo Club demonstrating that William and Kate are not constrained by “blue for a boy, pink for girl” stereotypes when dressing their son. 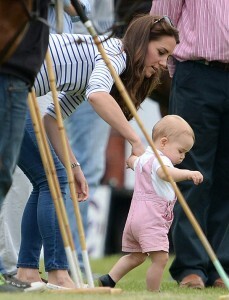 George’s overalls are reminiscent of earlier eras when all royal babies were dressed similarly. For example, the generation of European royal babies born in the two decades before the First World War wore white dresses as infants then sailor suits as toddlers. Prince William enjoys a close relationship with his son, George, and father, Prince Charles. Multiple generations of harmonious father-son relationships are rare in royal history. For centuries, raising an heir often meant raising a rival. The 18th century House of Hanover was notorious for the poor relationships between monarchs and their adult sons but other dynasties also had their share of absentee, resentful or overbearing royal fathers. In contrast, both Charles and William were present in the delivery room when their children were born and have taken an active role in child rearing. The History: Following the installation of their son as King Felipe VI, King Juan Carlos and Queen Sofia are expected to retain the titles of King and Queen. Spain’s government is also taking measures to ensure that Juan Carlos retains some degree of the judicial immunity he enjoyed as King after he abdicates, examining measure to prevent civil suits, such as paternity cases. 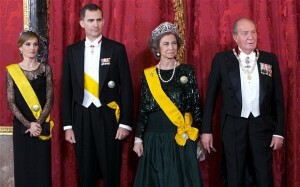 Spain has debated the appropriate title for a reigning monarch’s father before. When Juan Carlos became King in 1975, he succeeded the dictator Francisco Franco rather than his father, Infante Juan so the new King had to address the question of his father’s title under a restored Spanish monarchy. Two years after Juan Carlos became King, Juan formally renounced his rights to the throne and received the historic title of Count of Barcelona. Since the Catalan parliament in Barcelona approved a declaration asserting that Catalonia is a sovereign entity last year “Count of Barcelona” would be a controversial title for Juan Carlos in the 21st century. This past week, I joined a panel discussion on the Monocle 24 Foreign Desk radio show to discuss the Abdication of King Juan Carlos and the future of Europe’s monarchies. I discussed the Abdication of King Juan Carlos of Spain and the future of Europe’s monarchies with the BBC World Service this week. (My interview is the last 10 minutes of the program).